Our five nursery rooms are for children aged 4 months – 5 years. We offer unrivaled care and attention to ensure that you feel secure in the knowledge that your children are cared for in safe and enjoyable surroundings. A rich and varied environment supports children’s learning and development, giving them the confidence to explore and learn in a secure, safe, yet challenging environment. From time-to-time we engage our pupils in activities and events targeted at developing them socio-culturally. These include excursions, sports day, exhibitions, special days etc. Buttercups is strategically located. We judiciously adhere to our sound security policy. We pride ourselves in our conscious overall training of the child – morals, values, academics, discipline, health & hygiene, etc. Our friendly teachers are not only sound academically, they are trained to pamper. All resources used by the children are provided by the school. The children play and learn under active supervision. With a rich menu, we provide meals for the children everyday. Also, you can be rest assured your child is safe. 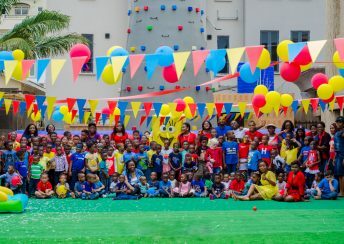 Big thanks to Buttercups school for nurturing our children during our 2-year stay in Nigeria. Alex and Eldrich have settled down in their new school in Indonesia and are doing very well. This is to thank Buttercups school, Koko was only 26 months when he entered the nursery school. He only could speak mama and papa. But now, he is capable of doing many things such as counting 1 to 10 and identification of colours. Thank you very much Ms. Ofunne, Koko loves you much. A thank you for taking care of my kids. Funminiyi started here when he was 11 months and he has indeed grown. We appreciate the love and care you gave to each child. Funminiyi had to leave but you still have a special place in our hearts for the peace you gave to parents.